We developed a horizontal slice preparation of the adult mammalian retina with the plane of sectioning parallel to the retinal surface. Dendritic fields of nonradially oriented retinal neurons were not truncated, allowing the study of signal processing with patch-clamp and imaging techniques. Feigenspan, A., Babai, N. Z. Preparation of Horizontal Slices of Adult Mouse Retina for Electrophysiological Studies. J. Vis. Exp. (119), e55173, doi:10.3791/55173 (2017). Vertical slice preparations are well established to study circuitry and signal transmission in the adult mammalian retina. The plane of sectioning in these preparations is perpendicular to the retinal surface, making it ideal for the study of radially oriented neurons like photoreceptors and bipolar cells. However, the large dendritic arbors of horizontal cells, wide-field amacrine cells, and ganglion cells are mostly truncated, leaving markedly reduced synaptic activity in these cells. Whereas ganglion cells and displaced amacrine cells can be studied in a whole-mounted preparation of the retina, horizontal cells and amacrine cells located in the inner nuclear layer are only poorly accessible for electrodes in whole retina tissue. To achieve maximum accessibility and synaptic integrity, we developed a horizontal slice preparation of the mouse retina, and studied signal transmission at the synapse between photoreceptors and horizontal cells. Horizontal sectioning allows (1) easy and unambiguous visual identification of horizontal cell bodies for electrode targeting, and (2) preservation of the extended horizontal cell dendritic fields, as a prerequisite for intact and functional cone synaptic input to horizontal cell dendrites. Horizontal cells from horizontal slices exhibited tonic synaptic activity in the dark, and they responded to brief flashes of light with a reduction of inward current and diminished synaptic activity. Immunocytochemical evidence indicates that almost all cones within the dendritic field of a horizontal cell establish synapses with its peripheral dendrites. The horizontal slice preparation is therefore well suited to study the physiological properties of horizontally extended retinal neurons as well as sensory signal transmission and integration across selected synapses. Visual information is coded as a dynamic spatio-temporal pattern of photoreceptor activation, and the ribbon synapse between photoreceptors and second-order neurons determines the downstream transfer of visual information. The vertical slice preparation of the mammalian retina is a highly valuable tool to study signal processing in vertical pathways, i.e. between photoreceptors and bipolar cells, and between bipolar cells and some types of amacrine cell1,2,3,4. However, vertical sectioning always causes severe truncation of the dendritic fields of many retinal neurons, leading to considerable loss of synaptic contacts. Especially in the outer retina, horizontal cells are affected due to their laterally spread extended dendritic fields and axon terminal systems5. In a vertical slice preparation, the synaptic input of hundreds of cone photoreceptor terminals to the dendrites of a horizontal cell is thus reduced to a few sparse contacts. This might suffice to study the properties of individual synapses, but it does by no means represent the signal processing capabilities underlying the synchronized activation of photoreceptor ribbon synapses. We therefore developed a horizontal slice preparation, which leaves almost all of the cone photoreceptor synaptic input to horizontal cell dendrites intact and functional. The plane of sectioning runs parallel to the surface of the retina, ideally cutting through the inner nuclear layer between horizontal cells and amacrine cells. Thus, horizontal slices of the outer retina are created containing, on the presynaptic site, photoreceptors with inner and outer segments as well as synaptic terminals, and horizontal cells and bipolar cells on the postsynaptic site. This preparation is well suited to investigate coordinated synaptic inputs into horizontal cell dendrites by all cone photoreceptors within its dendritic field. It thus might prove useful to better understand the workings of the photoreceptor ribbon synapse, which is crucial for the transfer of visual information from the matrix of photoreceptor activation into a postsynaptic response. All procedures were carried out in accordance with the guidelines for animal experiments issued by the Federal Republic of Germany. NOTE: Because the retinal tissue will be devoid of oxygen during prolonged parts of this procedure, all steps should be carried out as fast as possible. Mice should be dark-adapted at least 3 hr before dissection. To avoid light adaptation of the retina, preparation and slicing should be carried out under dim red light. Prepare Ames' Medium6. After dissection, immerse retinal tissue in Ames' Medium at all times. Dissolve 2.2 g of Ames' Medium and 298 mg HEPES in 250 ml distilled water. The concentration of HEPES will be 5 mM. Stir gently until all particles are dissolved. Bubble Ames' Medium at room temperature with carbogen (95% oxygen, 5% carbon dioxide) for at least 5 min. Supply carbogen with a glass Pasteur pipette to the solution. Connect the Pasteur pipette via appropriate tubing to the outlet of the gas regulator. Add 475 mg sodium-bicarbonate to the solution. The addition of bicarbonate after bubbling prevents precipitation of calcium carbonate. Prepare low gelling temperature agarose. Agarose is required for embedding of retinal tissue during vibratome sectioning. Dissolve 180 mg agarose in 9 ml Ames' Medium and 1 ml distilled water. Use a microwave to slowly heat the agarose solution until all solids are dissolved. Heat in 5 - 10 sec increments to avoid overflow. Solution should be clear and transparent. Store dissolved agarose in water bath at 37 °C for duration of the procedure. NOTE: All sectioning has been carried out with the vibratome listed in the Materials Table. The given settings refer to this type of vibratome only. For further details on vibratome sectioning of neural tissue please refer to reference7. Place vibratome injector blade into blade holder. Measure vertical deflection of the blade with the "vibrocheck" device. Use the adjustment screw on the blade holder to tilt the blade until it is parallel to the cutting plane. The exact positioning of the blade is necessary to prevent venetian blind effects on the section surface and to produce a flat section that contains living cells on its surface. Set vibratome to the following settings: amplitude, 1.00; speed, 0.20; thickness, 180 - 200 µm. Anaesthetize adult C57BL/6 mouse by vaporization of about 1 ml isoflurane in an air-tight container. When anesthesia is complete, euthanize animal by cervical dislocation. The mouse should not be older than 3 months, otherwise the quality of the slices will deteriorate. Remove eye ball by placing a curved forceps under the eye. Gently lifting up the eye ball will expose the optic nerve. Cut the optic nerve with a spring scissor and transfer the eye ball to a 35 mm petri dish containing 2 ml Ames' Medium. Carry out all subsequent steps on the stage of a stereo microscope. Adjust the magnification to a value that allows optimal visual control of the following procedures (steps 3.4 - 3.9). Puncture the cornea at the transition to the sclera with pointed forceps or a 20 G needle. During this step, steady the eye ball with another forceps. Be careful not to damage the retina with the puncturing device. Insert the spring scissors into the small hole made in step 3.3 and cut a circle around the cornea. Again, steady the eye ball with forceps while cutting. Keep the incision very close to the surface in order not to cut into the retina. Carefully remove cornea, lens, and vitreous body with forceps. The vitreous body comprises only a thin transparent layer in the back of the eye. However, it is essential for vibratome sectioning that the vitreous body is fully removed. In the petri dish, position the eyecup in a way that one looks through the hole down onto the retina. The rim of the opening should consist of scleral tissue only. If the circular cut (step 3.4) has been carried out too close to the equator of the eyecup, retinal tissue will also be present close to the incision. Be careful then not to damage the retina in step 3.8. Grab the sclera with forceps and carefully tear the tissue apart. It is essential not to rupture the retina during this step. If necessary, detach the retina from the ora serrata by steadying the scleral part of the tissue with the forceps and carefully peeling off the retina with the other forceps. Keep the forceps closed; never handle the retina with forceps since the tissue is very soft and will give way immediately. NOTE: At this step, the retina and the rest of the eyecup will be connected only at the optic nerve head. Cut the attachment site at the optic nerve head with the spring scissors. The retina should now be freely floating as a single piece of tissue in Ames' Medium. Cut the retina into 4 - 6 small rectangles of approximately 23 mm using a curved scalpel blade by holding the retina along the edges with the forceps, to manipulate it into position. Avoid pinching the retinal tissue within the rectangles. Take pieces from the central parts of the retina, not the far periphery. Transfer retinal pieces with a large-diameter plastic Pasteur pipette to a 35 mm plastic petri dish, the bottom of which has been replaced by a mesh with grid size less than 1 mm. Fix the Petri dish within the upper third of a beaker or conical flask and submerge retinal pieces in Ames' Medium bubbled with carbogen. Carefully transfer 2 - 3 retinal pieces into a 35 mm plastic Petri dish together with some of the Ames' Medium. It is most convenient to use a large-diameter plastic Pasteur pipette for transfer. In this step, the exact orientation of the retinal pieces does not matter. Remove as much as possible of the remaining Ames' Medium with a glass Pasteur pipette. As soon as the fluid has been removed proceed with step 4.3. Do not let the retinal tissue dry. Immediately cover retinal pieces with 2 ml of dissolved agarose (37 °C). Given the size mentioned in step 3.10, the pieces will not curl up within the agarose. Within the liquid agarose, gently push retinal pieces to the bottom of the petri dish. The ganglion cell layer should be facing down. Use a stereo microscope for judgement of exact position. For positioning, handle retinal pieces with a small spatula. Position the retina as fast and precise as possible since the agarose will solidify quickly. Arrange retinal pieces parallel to the bottom of the glass dish; otherwise sections will be tangential or oblique. Individual pieces should not touch each other, but also should not be too far apart. Try to place retinal pieces more or less on the same horizontal level. Put glass petri dish with embedded retinal pieces into the refrigerator (4 - 6 °C) for at least 2 min. This will quickly harden the agarose for further processing. As soon as the agarose has polymerized proceed with the next step. Carefully remove the agarose block containing retinal pieces from the petri dish. Use a spatula or a similar device to lift the agarose block from the glass. Due to adhesive forces, this can turn out to be quite difficult. However, avoid breaking the agarose block. Carry out this and all subsequent steps at room temperature. Place the agarose block on a glass coverslip and adjust its size with a scalpel blade. Leave 1 - 2 mm of agarose on each side of the retinal pieces. The final size of the block should be around 1,066 mm (10 mm refers to the height of the block, 6 mm to its edge length). Glue the agarose block to the specimen holder of the vibratome using an instant adhesive. Retinal pieces should be located at the top of the 10 mm high block and oriented parallel to its surface, while the bottom is affixed to the holder. Cover the block immediately by pouring the previously bubbled Ames' Medium into the buffer tray of the vibratome. Start sectioning. At first, set the thickness of slicing manually until fragments of retinal tissue appear in the slice. Then change to the settings in step 2.3. Since the mouse retina is only about 200 µm thick, there will be no more than 2 - 3 slices per agarose block. Remove sections from the buffer tray with a glass rod and transfer them to 2 ml Ames' Medium in a 35 mm Petri dish. Store sections immediately in an incubator at 37 °C (5% CO2/55% O2). The agarose surrounding the sections will stay solid in the incubator and can be used to handle the sections without damaging the retina. Better slice quality is obtained when storing at 37 °C within the respective atmosphere compared to oxygenated Ames' Medium at RT. Sections can be used immediately or can be stored up to 4 hr in the incubator with good physiological results. Embed next retinal pieces in agarose and repeat Sections 4 - 6. In horizontal slices of the mouse retina, horizontal cell bodies could be easily identified according to their unique morphology with several primary dendrites emerging from a polygonal cell body (Figure 1A). Horizontal cell bodies located near the surface of the slice were routinely accessible for patch-clamp electrodes. During recordings, cells were filled with a fluorescent dye, revealing their intricate dendritic arborization, which closely resembled the morphology of axon-bearing horizontal cells of the intact mouse retina8 (Figure 1B). Labeling of cone pedicles with fluorescein-coupled peanut agglutinin showed a close spatial relationship between cone pedicles and horizontal cell dendrites (Figure 1C). With few exceptions, all cone pedicles within the horizontal cell's dendritic field were contacted by dendritic processes. To prove that the contacts between cones and horizontal cells were functional, patch-clamp recordings were carried out from horizontal cell bodies. Under dark-adapted conditions, current responses were characterized by a large inward current accompanied by moderate to high-frequency synaptic activity (Figure 2A). The deviation from baseline and the excitatory postsynaptic currents were caused by the constant release of glutamate in the dark, activating postsynaptic AMPA- and kainate-type glutamate receptors9. 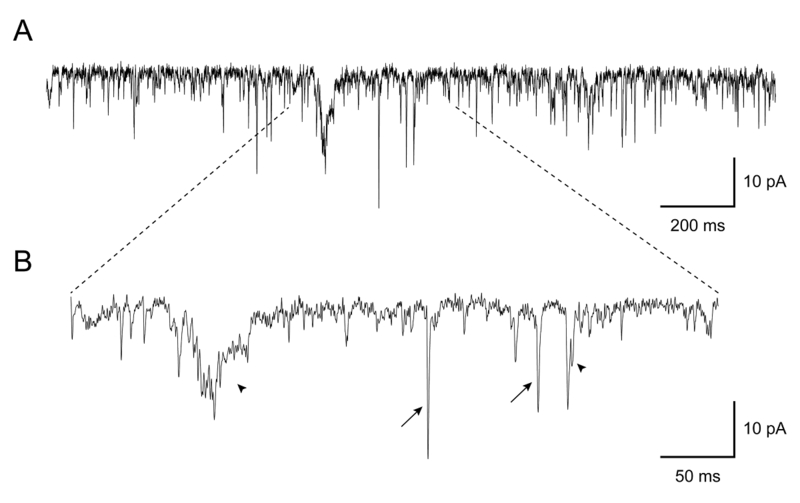 Individual synaptic events were characterized by a monophasic waveform or more complex current trajectories (Figure 2B). The presence of tonic postsynaptic activity suggests that glutamate was released at the synaptic contacts between cone photoreceptors and horizontal cell dendrites shown in Figure 1C. Horizontal cells recorded responded to changes in light intensity, indicating that the signal transduction cascade in cone photoreceptors was also intact and functional in a horizontal slice preparation. Due to the reduction of transmitter release, the tonic inward current of dark-adapted horizontal cells was inhibited, and synaptic activity appeared clearly diminished during the presence of a full-field light stimulus (1,300 W/cm2, 470 40 nm) (Figure 3A). Likewise, a switch to darkness from a light-adapted state caused an inward current and increased synaptic activity (Figure 3B). In addition, brief electrical pulses (1-15 V, 1 msec) were applied through a platinum-iridium bipolar stimulation electrode to depolarize all cone photoreceptors in the vicinity of a horizontal cell body. 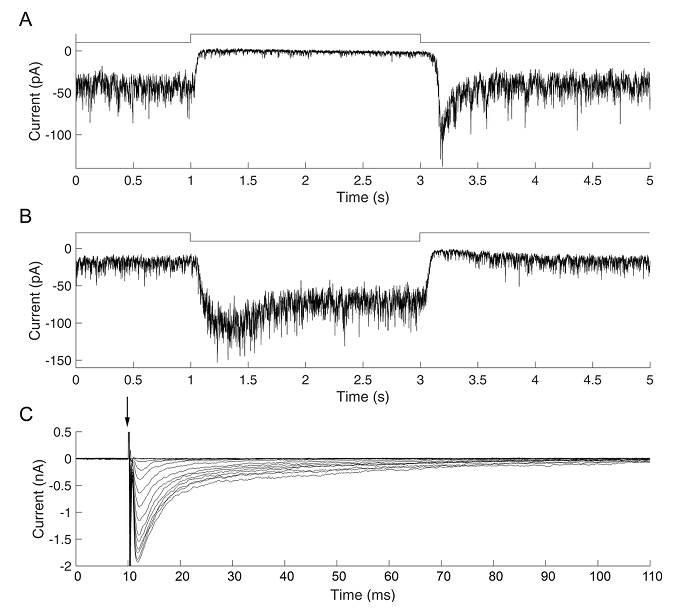 The stimulation-induced release of glutamate evoked large amplitude excitatory postsynaptic currents in the recorded horizontal cell (Figure 3C). In summary, these findings show convincingly that the synapse between cone photoreceptors and horizontal cells can be manipulated experimentally by either the endogenous stimulus light or by controlled depolarization of presynaptic elements. Figure 1: Morphology and Synaptic Contacts of Horizontal Cells in a Horizontal Slice Preparation. A horizontal cell (arrow) located near the surface of the slice was visualized with Dodt contrast optics. Scale bar = 10 µm (A). For imaging experiments, a horizontal cell was filled with Oregon Green 488 BAPTA-1 (100 µM) via a patch-electrode, which is still attached to the cell. Scale bar = 10 µm (B). Overlay of a dye-injected horizontal cell and the array of cone pedicles labeled with fluorescein-coupled peanut agglutinin reveals putative synaptic contacts. Scale bar = 10 µm (C). Please click here to view a larger version of this figure. Figure 2: Synaptic Activity Recorded from a Horizontal Cell Body. Whole-cell voltage-clamp recording at a holding potential of -60 mV shows high-frequency tonic synaptic activity (A). At higher temporal resolution (B), synaptic events display monophasic waveforms (arrow) or more complex current trajectories (arrowheads). Please click here to view a larger version of this figure. Figure 3: Current Responses of Horizontal Cell Bodies Evoked by Light and Electrical Stimulation. Light response of a dark-adapted horizontal cell body recorded at -60 mV holding potential. Full-field illumination inhibits the tonic inward current and reduces synaptic activity (A). A light-adapted horizontal cell body recorded under the same conditions displays an inward current following a dark flash accompanied by increased synaptic activity during darkness (B). Horizontal lines in A and B represent the timing of the stimulus. Extracellular stimulation by brief electrical pulses induces large-amplitude excitatory postsynaptic currents due to the synchronized release of glutamate from cone photoreceptors (C). Holding potential: -60 mV. The arrow indicates the timing of the stimulation pulse. Truncated currents at the beginning of the trace represent stimulation artefacts. Please click here to view a larger version of this figure. In contrast to vertical slices, the dendritic morphology of radially oriented neurons like horizontal cells and amacrine cells is well preserved. Compared to whole retina preparations, these cell types are easily accessible for microelectrodes and can be studied by both electrophysiological and imaging techniques. Here, we focused on the outer retina; however, a similar approach has been reported especially for amacrine cells of the inner retina10. The properties of the horizontal slice preparation have several implications for functional studies. The number of synaptic contacts between cone photoreceptors and postsynaptic horizontal cells was nearly indistinguishable from the intact retina. Synaptic contacts were functional, showing tonic release of neurotransmitter in the dark. The synapse could be activated by either endogenous stimuli like light/dark transitions or by external bipolar stimulation. One critical step of the technique is the isolation of the retina itself, which should be carried out as fast as possible without damaging the tissue. In addition, the presence of remnants of the vitreous body negatively affects the quality of the slices. Another critical step is the correct positioning of the retinal pieces. Although utmost care is taken to locate the retinal pieces parallel to the bottom of the glass dish, the plane of sectioning might still run slightly tangentially through the retina. Depending on the angle, the dendritic field of radially oriented neurons will be more or less truncated. The technique presented here is mostly limited to horizontally oriented neurons. Therefore, it is not possible to record from photoreceptors and intact bipolar cells in a horizontal slice, since the bipolar cell axons will be truncated. In addition, it is impossible to perfectly control the level of sectioning. A single retinal piece might thus be cut at an undesired level, for instance between outer and inner segments of photoreceptors. Increasing the number of retinal pieces within one block of agarose increases chances of a correct plane of sectioning at least in one piece. The horizontal slice preparation is well suited to studying the unique properties of ribbon synapses of rod and cone photoreceptors. So far, we have used an animal knock-out system to investigate the role of presynaptic proteins complexin 3 and complexin 4 on synaptic transmission between cone photoreceptors and horizontal cells11. It is also possible to study the properties of postsynaptic neurotransmitter receptors, as shown previously9. Future applications will include the study of synaptic proteins based on transgenic mouse lines with electrophysiological and imaging techniques. It will also be possible to investigate the biophysical properties of gap junctions between horizontal cells. Since light responses can be measured, the technique will also be used to investigate the encoding of endogenous stimuli at the first synapse of the visual system. It is possible to carry out the preparation in darkness to prevent light adaptation of the tissue, otherwise the light responses will be largely cone-driven. In summary, the horizontal slice preparation represents a novel approach to increase the accessibility of individual synapses as a prerequisite to studying their functional properties in the mammalian retina12. This work was supported by the Deutsche Forschungsgemeinschaft DFG FOR701 and FE464/11-1 to A.F. The authors want to acknowledge the excellent technical assistance of Andrea Nerz. DeVries, S. H., Li, W., Saszik, S. Parallel processing in two transmitter microenvironments at the cone photoreceptor synapse. Neuron. 50, 735-748 (2006). Jackman, S. L., et al. Role of the synaptic ribbon in transmitting the cone light response. Nature Neuroscience. 12, (3), 303-310 (2009). Rabl, K., Cadetti, L., Thoreson, W. B. Kinetics of exocytosis is faster in cones than in rods. J. Neurosci. 25, (18), 4633-4640 (2005). Singer, J. H., Lassová, L., Vardi, N., Diamond, J. S. Coordinated multivesicular release at a mammalian ribbon synapse. Nature Neuroscience. 7, (8), 826-833 (2004). Peichl, L., González-Soriano, J. Morphological types of horizontal cell in rodent retinae: a comparison of rat, mouse, gerbil, and guinea pig. Vis. Neurosci. 11, 501-517 (1994). Ames, A., Nesbett, F. B. In vitro retina as an experimental model of the central nervous system. J. Neurochem. 37, (4), 867-877 (1981). Mathis, D. M., Furman, J. J., Norris, C. M. Preparation of acute hippocampal slices from rats and transgenic mice for the study of synaptic alterations during aging and amyloid pathology. J. Vis. Exp. (49), (2011). Peichl, L., Sandmann, D., Boycott, B. B. Comparative anatomy and function of mammalian horizontal cells. Development of the Retina. Plenum Press. New York. (1998). Feigenspan, A., Babai, N. Functional properties of spontaneous excitatory currents and encoding of light/dark transitions in horizontal cells of the mouse retina. Eur. J. Neurosci. 42, (9), 2615-2632 (2015). Enoki, R., Jakobs, T. C., Koizumi, A. Horizontal slice preparation of the retina. J. Vis. Exp. (1), e108 (2006). Babai, N., et al. Functional roles of complexin3 and complexin4 at mouse photoreceptor ribbon synapses. J. Neurosci. 36, 6651-6667 (2016). Thoreson, W. B. Horizontal slices of mouse retina expose horizontal cells and their properties (Commentary on Feigenspan & Babai). Eur. J. Neurosci. 42, (9), 2613-2614 (2015).